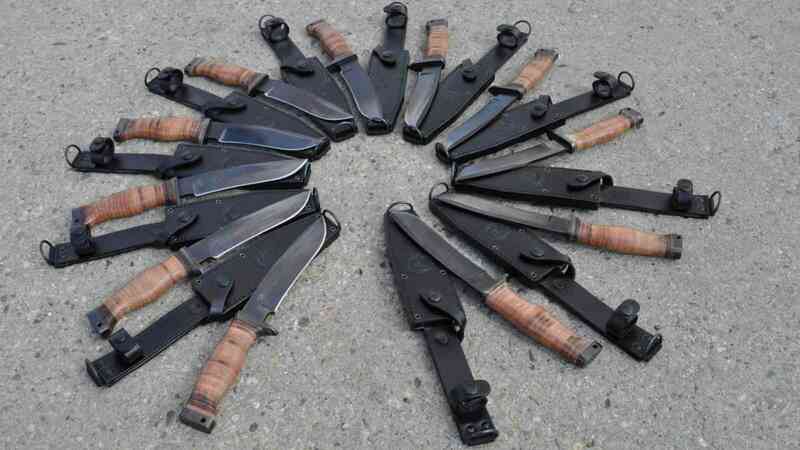 Griphon knife is designed for members of the 41st mechanized battalion in Žatec. It is a combination of offensive and multi-purpose knife with a greater chance of survival for use in combat deployment. On the left side of the blade is the czech inscription “Pochudej nebo zemři”, which means “march or die.” On the right side of the blade is the logo creator and manufacturer of knives and a numerical designation. Griphon is made of spring steel 14260th. The handle is made of leather rings withdrawn threaded cap. The steel head has a 4mm diameter hole for a lanyard. Between the blade and the handle is one-sided steel bulwark. At the top of the blade’s thumb rests. Griphon made by Mr. Lubomir MAĎARIČ from Brno. Sheath is engraved on the front page logo 41st mechanized battalion and its manufacturer the company Hess Brno.